Camping tents are often rated by season in order to give campers an idea of what temperature -- and sometimes weather -- the tent is designed for. Season ratings for tents vary somewhat among manufacturers and among retailers. Some use the ratings to show how much weather (wind and rain) the tent can be expected to perform in. Others use season ratings to show mainly what seasons (warm or cold) the tent performs well in. Campetent has sorted through various season ratings and adapted them to family tents. Since family campers usually camp in mild seasons, but not always in mild weather, Campetent will focus the season ratings on weather, so they will be of most use to family tent enthusiasts. The guidelines below will help campers rate family tents for personal use. The chart at the bottom of the page provides a summary of the guidelines. may not feature any guy-out loops on the tent body or rainfly, or may instead have just one at each corner. A 2-season tent with enough ceiling mesh and low vents can ventilate well and be quite comfortable on a very warm night. will not provide a vestibule, but may provide a canopy over the door and windows. Campers may choose to spray the exterior tent walls with a tent fabric sealer in order to improve the fabric performance in rain. Although this is not recommended for a high-quality tent until it is several years old, it is practical for a new, inexpensive tent. Spraying the walls may, however, make it impossible for tent-fabric repair tape to adhere to the exterior tent wall. 2-season tent walls may become damp in light-to-moderate rain, but won't necessarily leak. The tent should still perform, as long as the seams are sealed. Campers should keep clothing and sleeping equipment from directly touching any walls not covered by a rainfly. In heavy rain, it may be necessary to tarp the tent in order to keep the interior comfortable. This is a simple and effective way to help a 2-season tent to perform in moderate-to-heavy, vertical rain. big boxy bargain department-store cabin tents--although these may be closer to 1-season tents. 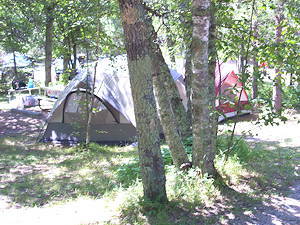 Economy and department-store, family-camping tents often fall under the 2-season tent category. Economy tents that do not list specs for their tent fabric (HH) or poles (diameter) should be considered 2-season tents. 2-season tents offer families an economical way to get started camping at local campgrounds in mild weather. They are suitable for forested campsites in light-to-moderate wind and for exposed campsites in fair weather to light wind and rain. 2-to-3 season tents perform in moderate to strong winds and moderate, wind-driven rain. They are more weather resistant than 2 season tents. Depending on design, they can also be warmer on cool evenings. Many popular tents of experienced family campers fall into this category, as these tents offer a good compromise between desired features and price. offer tent-body and rainfly fabric coated from 800mm to 1200mm HH with polyurethane. feature fiberglass, fiberglass/steel, steel or aluminum poles. feature a guy-out loop along each vertical pole of the tent. can both ventilate well and take a fair amount of weather. feature half, 3/4 or occasionally full flysheets. If the partial rainfly overhangs the ceiling mesh by several inches, these tents should keep out moderate, wind-driven rain. Exposed 2-to-3 season tent walls (for tents with partial rainflies) may become a bit damp from moderate-to-heavy, wind-driven rain. The tent should, however, still perform, as long as the seams are sealed and the poles are strong enough. In light-to-moderate rain, the walls should remain dry. These tents often feature heavier nylon floor fabric, instead of polyethylene tarp, to better withstand the foot traffic from family camping, as well as rough ground. A few feature heavy woven, Oxford-nylon floors, which offer the greatest durability. Nylon floor fabric for these tents is usually coated with polyurethane from 800mm to 1500mm HH to resist standing water around the tent. The high profile and abundant headroom of large 2-to-3 season tents appeal to family campers, especially tall campers and campers with older children. The high profile may, however, make the tent vulnerable to strong winds. Campers should use caution when camping in strong winds and guy out the tent thoroughly. 2 to 3 season tents are suitable for sheltered, forested campsites in moderate to strong weather and for exposed campsites in moderate weather. 3-season tents perform in strong wind and heavy, wind-driven rain. These tents are often family-camping offerings from tent manufacturers who design high-performance tents for backpacking or expeditions. Some smaller outfitter tents are also suitable as 3-season family camping tents. are generally not as large as some 2-to-3 season family camping tents (see above category) and may not offer as much headroom. still feature a lot of ceiling mesh, allowing moist air to escape from the tent body to the rainfly, where it is vented out of the tent. This reduces condensation inside the tent in rainy or cool weather, where these tents are often used. Although they offer more standing height and headroom, family-cabin tent designs are usually avoided with 3-season family tents in favor of more aerodynamic designs. Wall tents and frame tents are 3-season tents that offer a great deal of standing height and headroom. These tents are more of an outfitter tent than a family tent, take longer to set up and usually need a large flat site. Large, outfitter dome tents also offer stability in strong winds. One common feature of a 3-season tent is a full rainfly. sheds condensation down the inside of the flysheet to drip on the ground away from the tent body. Because of the full rainfly, the inner tent canopy fabric is often uncoated, breathable fabric to allow more moist air to escape. 3-season tents offer families good protection against foul weather and are suitable for exposed campsites in strong wind and heavy rain. Enthusiasts who camp in areas with strong winds or abundant rainfall should consider a 3-season tent. These guidelines will help you sort out various family camping tents and find a tent that meets your expectations. Conclusion: Campetent has adapted these categories to family camping tents in order to give campers a good idea of the performance they can expect from various family tents. Once tent campers become familiar with these categories, they should be able to easily rate tents by season and feel confident in their ability to select a tent for their camping situation.